The name Matt Grapenthien doesn’t really set off any alarms in the poker community. But it should be mentioned that Grapenthien has made a pretty good living through online poker cash games over the past decade. And he put his skills on display while winning the 2014 WSOP $10k Seven Card Stud Championship along with $268,473. Grapenthien’s victory pushes his live tourney winnings over $402k. But it’s a good bet that he’ll continue dedicating the bulk of his time to online cash games. Seeing as how playing at the biggest internet poker sites isn’t an option in Chicago, Grapenthien spends a lot of time in Canada. However, he still likes to come back to the States and compete in live events, especially in Stud tournaments. Just a week after the $1 million buy-in Big One for One Drop ended, the tournament’s much-smaller cousin, the $1,111 Little One for One Drop, took place. This event was once again a huge success, drawing 4,496 entrants and generating $499,056 in proceeds for the One Drop foundation. Before Event #62 of the 2014 WSOP, Dubinskyy had only managed a string of small cashes near his hometown of Kiev. 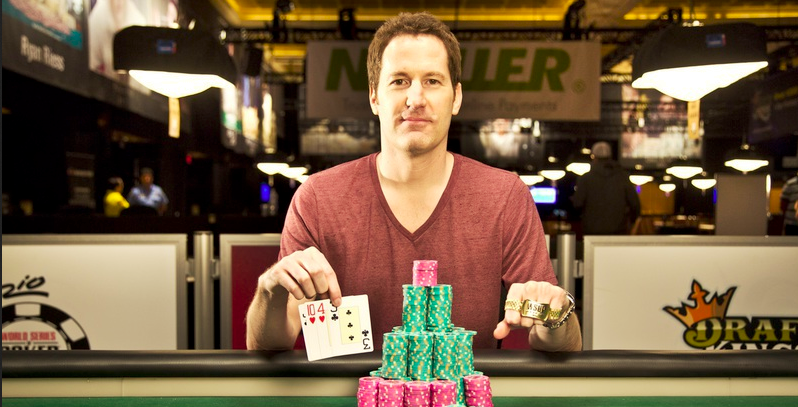 But now, the married father of three is a WSOP champion and has $771,724 in live tournament winnings. Gold bracelet winner Eric Baldwin also made the final table of this tourney, finishing in fifth place and collecting $156,352. Since 2007, Bryn Kenney has been establishing himself as one of the best-known names on the live tournament circuit. He’s earned almost $3.7 million in tourneys and has won three big events in Europe. But up until this point, one important thing had escaped Kenney – a gold bracelet. Well, the Californian can check this accomplishment off the list as he took down the $1,500 10-Game Mix (6 max) event along with $153,220. One thing that stands out about Kenney’s victory is how easy he made it look, rarely being challenged throughout the three-day tourney. He said that his skill and experience in six-max tournaments was a huge factor in the Event #63 win. By the time the final table was five-handed, Kenney had a 2:1 chip advantage on his next closest rival. He then used his big chip stack to keep busting the final few players until a heads-up match with Jan Suchanek. The New Zealander proved to be a tough heads-up opponent for Kenney, but he could never get the chip lead and settled for second place and $94,618. Event #64 – PLO specialist Pat Walsh wins… PLO Championship! Pat Walsh sure knows how to make the tournaments that he plays count. The long-time cash game grinder said that he only intends on playing two events at the 2014 WSOP: the $10k Pot-Limit Championship and the Main Event. So far, he’s one for one after winning the PLO Championship and $923,379. This was a highly competitive, 418-player field that featured plenty of strong pros. So it takes an experienced player to navigate through such a pro-heavy tournament. And Walsh is definitely not lacking in the experience department since he’s been grinding in PLO games around the St. Louis area for years. The 38-year-old grabbed the chip lead on Day 1 and rarely relinquished it. There was a short time when Walsh’s heads-up opponent, Javed Abrahams, had the chip lead. But Walsh quickly battled back to take the lead and cruise to his first gold bracelet. As for Abrahams, he just missed out on becoming Britain’s second bracelet winner of the 2014 WSOP, with John Kabbaj being the only one. However, the Brit can look towards his $570,284 second-place payout to cheer him up.